Vikram Prabhu's "Sigaram Thodu" has received positive reviews from the critics. Directed by Gaurav, "Sigaram Thodu" has Vikram Prabhu, Monal Gajjar in lead roles. The film also has Sathyaraj, Sathish and Mahesh in supporting roles. The film is produced by UTV Motion Pictures and its music is composed by Imman. 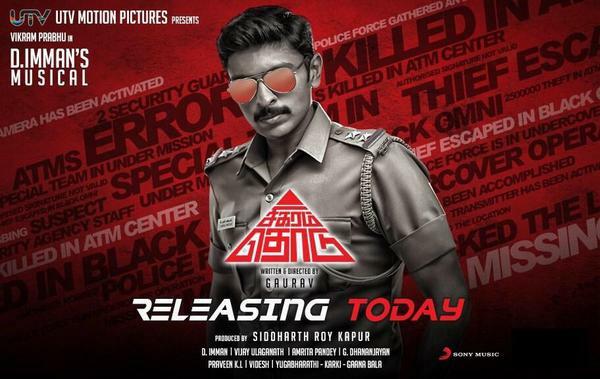 Check the full review of "Sigaram Thodu"
"Intelligent & well researched writing makes story convincing. Deals with how ATM cards r misused (recent ATM attacks)," - Sreedhar Pillai.